Remember this piece of muslin with leaves pounded into it? 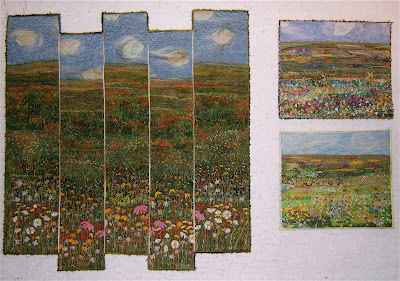 I have backed it with a thin layer of batting and embroidered many seed stitches between the leaves. I pieced the background fabrics that had been chosen to showcase the leaves. Then I machine quilted it. Yarns were also couched to the striped panel to give the effect of a stand of saplings. The loose ends will get trimmed away after something gets couched along the horizontal seams above and below that section. The leaf piece was added to the background and I machine quilted around the individual leaves. Now I'm in the process of add many more seed stitches that pass through all the layers and spill off the muslin panel onto the background. To view the beginning of this piece as well as other work that incorporates pounded botanical materials click on the label at the end of this post. Another study was needed to test out a mounting method with which I've been playing. This Monet-like "ortwork" piece is the result. It's one of the few that I've ended up keeping. It's hanging in my kitchen. If you'd like to see more of this cozy corner go and the artwork in my kitchen go here. The beginning steps to making these flowers is posted here. Lots of the blossoms and leaves are under the netting. Some leaves and petals are sewn to the surface leaving loose edges for an added dimension. I've based these flowers, their leaves, and growth patterns on real flowers. The yellow flowers are Partridge Pea and the red-violet ones are Purple Poppy Mallow. The white ones are a stalk of New Jersey Tea flowers while the others are Pale Purple Coneflowers. And these flowers are Tall Coreopsis. At this point I can only show bits of the flower pieces I'm creating. Someday the whole pieces will be posted along with why they're being made. I was so glad to discover an easier way to hang small quilts than sewing in a sleeve for a tiny dowel. I use this method to hang all my lake quilts. The corner pockets are made from two squares of fabric ... usually the same fabric as the backing for the quilt. Fold the opposite corners together to make a triangle. Press the fold. I sew the the pockets to the corners at the top of the quilt with a zig-zag stitch before finishing the edges of the quilt with a binding or couched yarn. Recently, I've been using these pockets to hold a flat piece of wood at the bottom of larger quilts to help them hang flat against the wall. This pair is cut and ready to be sewn to the Smoky Mountain quilt to ensure the bottom corners won't curl out. This is the way my "ortwork" flower pieces begin. Opps! I take that back. This is where they begin. Bags of scrap fabrics, thread ravels, strips of wool cut for rug hooking, roving, and disassembled silk plants. At this point one layer of netting has been applied and quilted just enough to keep all those bits and pieces in place on the background. I'm building another layer with flowers, stems and leaves plus more texture. I cut the silk flowers apart and shape them to resemble particular flowers for my composition. The cone flowers get centers from balled up strips of wool. The yellow coreopsis will be getting some of those, too. I love these bright pink poppies. The snippets from shaping petals become part of the piece as buds and flowers in the background. The leaves are also reshaped from my box of disassembled silk ones. I'm finding the backside of some are what is needed for a few of the plants. "Flitty" flits about in the United Kingdom. Go here to read more about him. I like his fancy headdress and tail feathers. 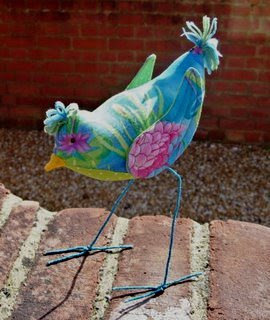 There are wonderful "tweets", birds made of wool fabric with fancy fabric wings, made by Jackie in the United Kingdom as well. Make a trip to her blog, Dog Daisy, to check out more of them. They are real characters! Flowers! I've been knee deep in flowers ... literally. All week I've been busy coming up with another variation of these. Studies I had made a year ago last fall. The Blue Bird's here in Tennessee are scoping out nesting sites. Watching them flit around in our yard inspired me to create my own version. A few months ago I granted permission to McCalls magazine to feature a project based on my bird pattern. 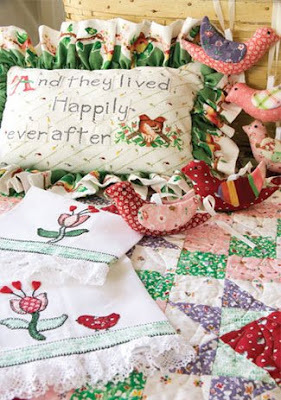 Their online magazine, "Quick Quilts" published it today.. These made by Kerry Joho look like sweet country cousins to my long-legged birds. Evidently kits for making them with RJR fabrics can be ordered through the magazine site. To make them from scratch, my pattern and instructions are free. Click on the links in my sidebar for access to download them to your computer for printing. 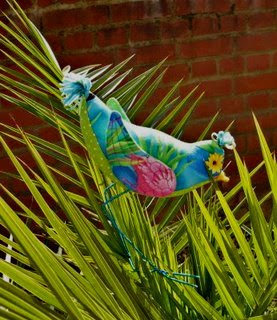 To see many interpretations of my bird by me and my friends click on the Picasa "Birds" album that is also located in my sidebar. Well, I do use my hands to guide the fabric ... and with this set-up I get to use both hands for that job. Since posting the tutorial for how I machine couch yarns to fabric, I've devised a set-up for the yarn to feed "hands-free". A container for the yarn is placed out of the way to the rear of my machine. I use the contraption made to feed thread wound on a cone for domestic machines to feed the yarn from the container. This set-up works only for couching yarn to the surface of fabric. The yarn still needs to be held and guided by hand to successfully couch it for an edge finish. The quilt in the photos is the one featuring the leaves I pounded in the Smoky Mountains last fall. You'll see more of what is being doing on it pretty soon. This method was used to couch the yarn to the frame bordering the "Our Biosphere Reserve" featuring the Smoky Mountains. This is the result of my "playing" with all those scraps. Our Biosphere Reserve - 40"x 31"
The Smoky Mountains National Park is designated as an International Biosphere Reserve by the United Nations in observance of the 75th anniversary of the establishment of Great Smoky Mountains National Park in 2009. This international recognition represents the Smokies' importance to the planet. The purpose of this United Nations' program is to recognize and encourage preservation of the world's great cultural and biological areas. This art piece features my interpretation of the view from "Morton's Overlook". 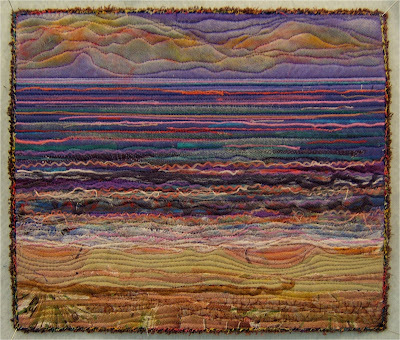 In the spirit of conserving our biosphere's resources this quilt is made from recycled or repurposed materials. The picture part is composed of fabric scrap bits and pieces from previous projects, both mine and other peoples. The foundation structure features an old blanket as the batting and upholstery fabric leftover from a friends project is the backing. It took concentrated effort to meet the deadline of presenting it at the Smoky Mountain Quilt Guild meeting last night. This was one of twenty-one quilts competing for inclusion in the SMQ Guild's entry for the Ultimate Guild Challenge in the AQS summer show. The theme chosen by our guild for its entry was "Go Green", which was open to interpretation by each participating member. Leah Marcum-Estes, director of the Oak Ridge Art Center, was invited to be the juror to select the eight quilts for this entry. We certainly presented her with a challenge to choose only eight from so many wonderful quilts. I'm pleased my quilt was one of those selected to represent the Smoky Mountain Quilt Guild. The SMQ Guild has won awards in three previous AQS Ultimate Guild Challenges. To see the quilts for the year we won the Grand Champion Award ($5000) go here. To see my quilt contributions for the other two award winning years go here and here.